If you have goods to move, the Citroen Dispatch won't let you down. A spacious loadspace with easy access make it a practical choice for businesses, while the comfortable, well-equipped cab will go down well with drivers who spend a significant amount of time behind the wheel. 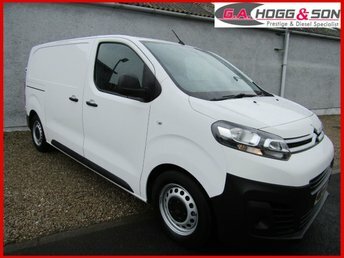 The best way to discover whether a used Citroen Dispatch is the right commercial vehicle for you is to get behind the wheel. At G.A Hogg and Son you'll find knowledgeable and friendly team members who'll help you to arrange a test drive and will go the extra mile to ensure you find the right used car to suit your individual requirements.